So, you’ve got the bucks, and there are plenty of guitars out there, but you have no idea about how to find the best acoustic guitar. Buying an acoustic guitar can be an overwhelming experience, especially if you’re a beginner. 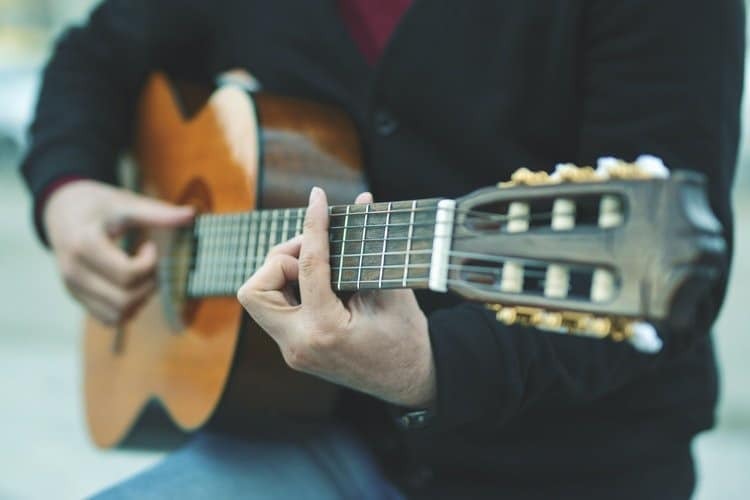 From perfect sound quality, great durability, enhanced tuning, to a robust build, you need to consider several factors before picking the best acoustic guitar. 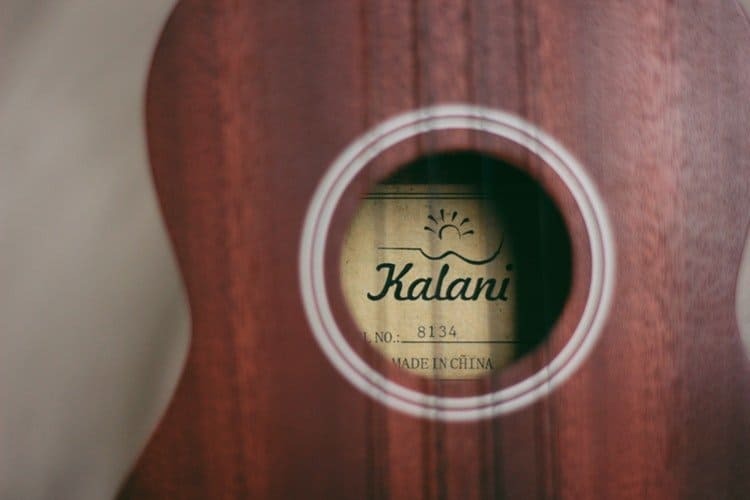 Whether you’re planning to purchase your first acoustic guitar or upgrade the existing version, a little help can go a long way. We understand exactly how essential it is for you to find the right guitar that not only suits your requirement but is also a good fit for your wallet. To help you make an informed purchase decision, our guitar experts have put together this buying guide. Here you’ll get to learn everything about acoustic guitars – their importance, features, body size, type of woods used and the best acoustic guitars on the market. 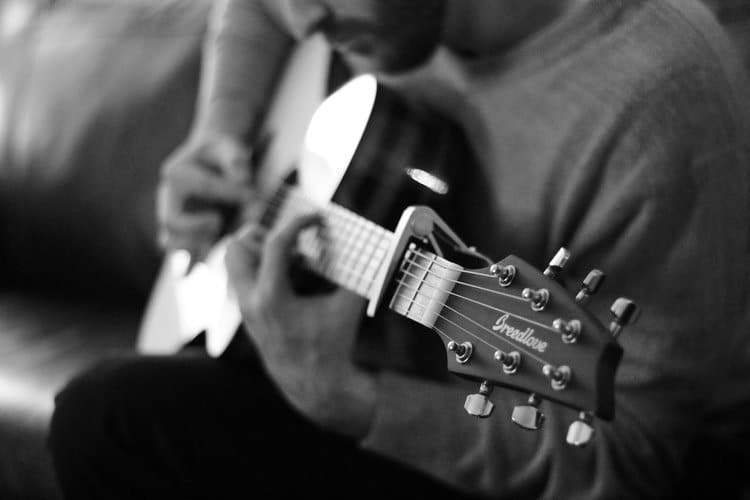 Read on to know more about how to find the best acoustic guitar. Why investing in a good acoustic guitar can make a difference? As you explore the market, you’ll find an array of features, quality, and price points. Our experts say: Buy the best acoustic guitar you can afford. You’ll sound better each time you play, even when you’re strumming basic chords. Your guitar playing experience will be more enjoyable. Your skills will improve more quickly. Nothing’s worse than a guitar that doesn’t stay in tune and is hard to play. Nevertheless, the good news is that good quality acoustic guitars are available on the market at different price points. Any impressive guitar should provide players with certain fundamental qualities such as a clear tone, playability, and a suitable intonation. However, each person’s relationship with their acoustic guitar is unique. And, buying an acoustic guitar is a multisensory experience – part tactile, part visual, and part sonic. Sometimes, guitar players find love in acoustic guitar at the first strum, while other times an acoustic guitar reveals its trump cards over a few playing sessions. 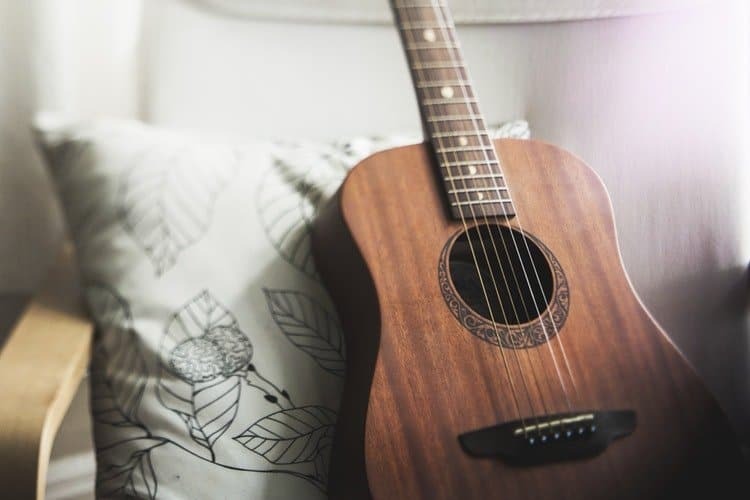 Nevertheless, what matters the most if that you find an acoustic guitar that inspires you, so spend some time and explore the market; if you pay attention, you’ll find the best acoustic guitar in no time. Typically speaking, the louder and stronger the sound you’re looking for, the bigger the acoustic guitar you’ll need. The acoustic guitar you choose will depend a lot on your playing style and other aesthetic features, both in terms of looks and sound. So, if you’re a beginner, and have not defined your player profile yet, don’t worry. 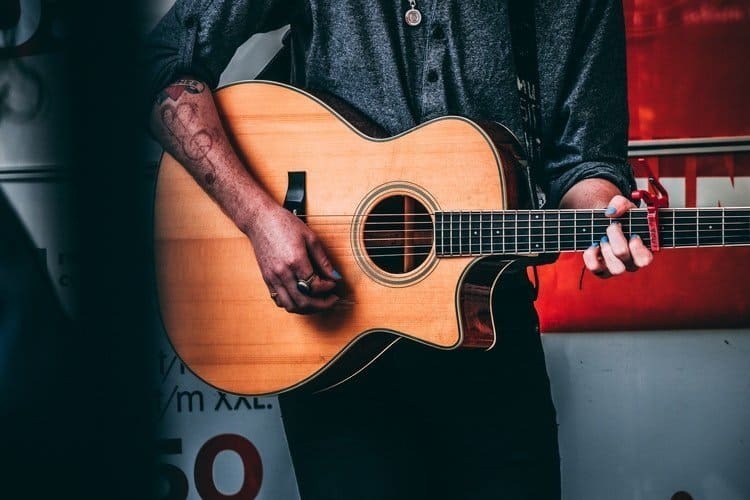 We’ll help you identify your playing style so that you can find an acoustic guitar that best suits your player profile. How do you plan to play the guitar: Flatpicking, fingerpicking, strumming, or a mix? This will help you decide whether you want a versatile acoustic guitar or something that suits a more customized playing style. If you play delicately, you’ll need a small acoustic guitar. If you’re a heavy picker, you’ll need a full-bodied acoustic guitar with great energy. And, if your playing style is hybrid, a medium-size guitar can be the best bet for you. You’ll get an instant response when you pick lightly and an enhanced sound when you dig deeper. Where are you planning to play the guitar? If you sit and play, you’ll need an acoustic guitar that’s comfortable to play – with a smaller body. If you’re planning to participate in a jamming session with your friends, you’ll require a guitar with a bigger body and greater acoustic volume. And, if you plan to play live, you’ll require a guitar with good pick-up. Think of your music genre and style. Do you plan to play the guitar with other instruments? If you’re planning to play the “guitar only,” you’ll need an acoustic guitar with a broader sonic palette to provide you with an array of tonal colors. And, if you’re planning to play the guitar along with other instruments, you may want an acoustic guitar with great clarity and volume to be easily heard in the loud instrumental mix. Are you looking for specific tonal properties? If you have a certain tonal characteristic in mind, you need to look for the right body shape and tonewood. Rosewood tends to enhance the high and low end of the musical spectrum; mahogany works well in the mid-range; a cedar top body produces music with a warmth that glows with fingerpicking. An acoustic guitar with a bigger body provides more volume and bass response, and an acoustic guitar with a smaller body provide better tonal clarity. Are you planning to sing with your guitar music? If yes, you would like your guitar’s tonal persona to blend well with your voice. A rosewood acoustic guitar is perfect for vocals as it comes with a scooped midrange, i.e., the frequency range for the human voice. Understanding the components of an acoustic guitar can help you a great deal in understanding different models and their features. The body of an acoustic guitars works like an acoustic amplifier or sound box for the vibrating strings. The string tension is altered by tuning individual strings to a set frequency and fretting them through the fretboard. When you strum or pluck the strings, the vibrational energy is transmitted to the guitar’s top with the help of the bridge and the saddle, which anchors the chords to the top. The top then vibrates along with the back and sides of the guitar to produce sound, projecting it from the sound hole. The guitar’s body – The contours of an acoustic guitar shape it’s sound. Type of woods used – Each type of wood comes with a different tonal quality that seasons the sound. The internal setup – This controls the motion of the back, top, and sides, working in sync with the body’s shape and woods to produce sound. Steel strings vs. nylon strings in acoustic guitars – What’s the difference? Besides the material of the strings, the playing experience and tone are different. 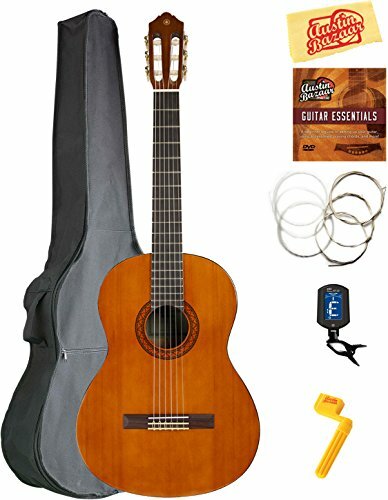 An acoustic guitar with steel strings comes with greater string tension and produces brighter, louder sound with more tonal sustain from the strummed or plucked strings. An acoustic guitar with nylon strings comes with lower string tension and produces a much softer sound with less sustain. Which is better for acoustic guitar beginners? Acoustic guitars with nylon strings are suitable for beginners. They’re easier to press down to produce chords. Nevertheless, it’s also important to take into account the guitar’s neck dimensions. Most nylon string acoustic guitars have broader necks that can make it more difficult to form chords easily. Can nylon and steel strings be used alternately? The answer is “NO.” The construction of each type of guitar is different, especially the internal setup making it difficult to accommodate strings with different tensions. Since nylon strings have lower tension, they are braced and designed differently, in a much lighter way. Replacing steel strings with nylon strings wouldn’t produce the required tension to trigger the top and produce a good sound. Also, the strings will become cramped, and the saddle will not work properly. Selecting a body shape is a good way to narrow your search for the best acoustic guitar as the dimensions of a guitar play a pivotal role in producing the basic sound. The simplest way to classify guitar body shapes is in terms of the total size: small, medium, large, and mini (for kids). Some acoustic guitars come with a cutaway on the upper bout of the treble side. The provides players with better access to the frets close to the sound hole and widens the playing range of the acoustic guitar. Does a cutaway reduce the tonal quality? Not really. Even though the cutaway reduces the surface area of the soundboard and the total air cavity inside the guitar’s body, the portion of the upper bout that has the cutaway doesn’t vibrate as much as the other portions of the guitar, the tonal quality is mostly affected by the taper of the guitar’s waist. If you’re more bothered about the aesthetic appearance of your acoustic guitar, buy a non-cutaway guitar. However, if you want to touch the high notes, buy a cutaway acoustic guitar. The types of tonewoods used for the back, top, and sides of an acoustic guitar lay the foundation of its sound. The physical characteristics of each species of wood such as the density and stiffness are different. Tonewoods are categorized as softwoods and hardwoods. Softwoods are comparatively lightweight and come with a high tensile strength. The perfect combination of elasticity, lightness, and strength make softwood a suitable choice for the guitar’s top and soundboard. Examples of softwoods are cedar, spruce, and redwood. Hardwoods are denser and stiffer. Here, we’ve compared the typically used tonewoods in the acoustic guitar industry. Players who desire a rich acoustic voice with powerful bass and treble, plenty of sustain, and complex overtones. Ebony is widely used as the fretboard tonewood due to its high density. Some acoustic guitar manufacturers also used rosewood for the fretboard; however, due to its lower density, it is less robust than ebony. Some inexpensive acoustic guitars also come with fretboards made of Richlite, a complex material with low strength. Solid top vs. laminate top – Which is better? Acoustic guitar tops are typically made of either solid wood or laminate. A solid top is usually made of 2, single-ply wood pieces with their grains matched to the guitar top, whereas a laminate top is made of different layers of wood, multiple generic layers at the bottom and high-quality layers on the top flattened together. Laminate does not vibrate as efficiently as solid wood. Therefore, it does not produce as rich a sound or as powerful a volume. However, it can be a good option for beginners who’re on a shoestring budget for their first acoustic guitar purchase. Do you plan to play the guitar in a sitting or standing position? Most acoustic guitar players prefer the sitting position. The taper of the guitar’s waist and other body contours will influence how high the guitar will sit on your lap. For instance, an acoustic guitar with a broader waist with rest higher on you. How does the guitar’s body feel when you’re strumming or picking with your arm draped over it? If you plan to sit while you’re playing, a large, curvy bottom bout can push your strumming or picking arm higher and lead to discomfort. In this scenario, you won’t be able to play freely. If you’re a woman, sometimes the contours of the guitar can interfere with your body curves. If this is the case, an acoustic guitar with a smaller body can be an ideal choice for you. One of the most critical aspects of the guitar that contributes to a comfortable experience while playing is the structure of the guitar’s neck. The more comfortable the neck feels in your hands, the easier it will be to produce chords and notes. You’ll also feel less fatigued when you’re playing for longer periods. Since the size of the players’ hands can vary, the comfort of the neck is important. The profile refers to the shape of the neck’s backside, which will sit on your palm when you’re playing the acoustic guitar. Some guitars have broader profiles, while the others have narrower dimensions. A narrower profile is convenient to play. The width of an acoustic guitar’s neck is typically measured at the nut, where the neck joins the headstock. The wider the guitar’s neck, the more will be the distance between the guitar’s strings. A slimmer neck (1-11/16 inches) makes it easier to produce barre chords. Players with small hands prefer narower necks. A neck with medium width (1-3/4 inches) provides a balance of compressed spacing with enough area to individually fret the strings. A wider neck (1-7/8 inches or more) will be suitable for players with broader hands or longer fingers. Action refers to the height of the strings above the fretboard. Acoustic guitars with lower action are more convenient to fret. If the action is too low-slung, the strings will vibrate; if it’s very high, you’ll have to apply greater pressure to fret the strings. In the case of a properly intonated acoustic guitar, all the open strings and each fretted note on the fretboard will sound perfect. In simpler words, the guitar is in tune throughout the fretboard. This leads to uniformity of the music and a pleasant sound. The scale length refers to the length of the guitar strings from the nut to the saddle. Discrepancies in scale length can impact the string tension resulting in an uneven guitar tone. Different acoustic guitar manufacturers define their own scale lengths. 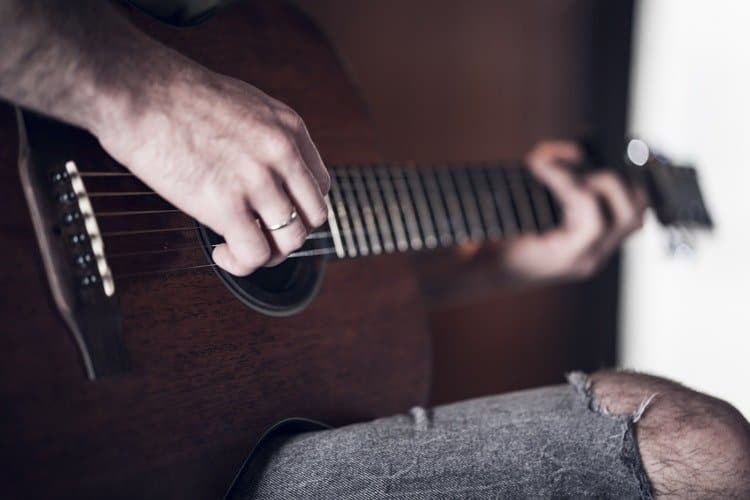 However, many guitar players, especially those with shorter hands prefer short-scale guitars as reduced string tension makes it easier to produce more notes with your finger. The neck is comfortable, and it’s easier to produce chords. It comes with decent intonation all the way up to the guitar’s neck. The sound is clean and consistent throughout the tonal spectrum. It produces a soothing level of volume and sustains. These days, many acoustic guitars come with onboard pickups which can be used to plug in an amplifier and enhance your sound. So, even if you’re a beginner and don’t see the use of the pickup anytime soon, you can buy a guitar with a pickup for the longer run. You can manipulate your sound. Some acoustic guitars with electronics are equipped with volume controls and tone knobs. Using these controls, you can adjust the bass, treble, and midrange levels of the acoustic guitar during amplification for different playing styles. You can add a variety of effects to your sound such as delay, reverb, and more, that provide you with an entire sonic spectrum to experiment. You can adjust the volume levels if you’re playing with other instruments. Our guitar experts have handpicked 5 best-selling acoustic guitars on the market for you. Their choices are based on hands-on testing and extensive market research. Let’s look at each of them in little more detail. The Yamaha C40 Classical Acoustic Guitar is a full-size guitar which is perfect for beginners. It’s cost-effective and comes with a rich, well-adjusted tone and a unique sound. The body is sturdy and built to last. So, if you’re a beginner and want to take your sound to an all new level, the Yamaha 40 Nylon String Acoustic Guitar can be a great pick for you. It’s a real deal for beginners. 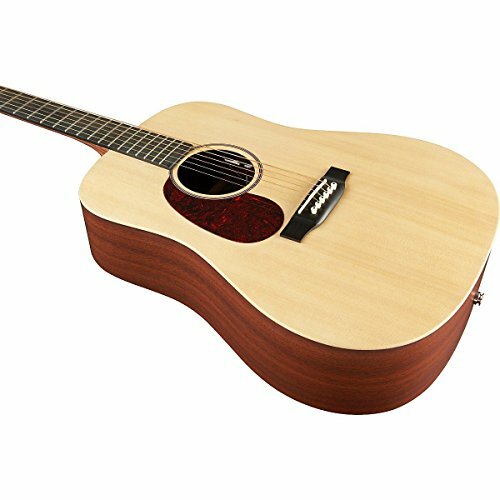 Fender FA-100 is a dreadnought acoustic guitar with tremendous value to all types of guitar players. Even though the features are not too exciting, the overall performance and sound are perfect for beginners, as well as professional players. 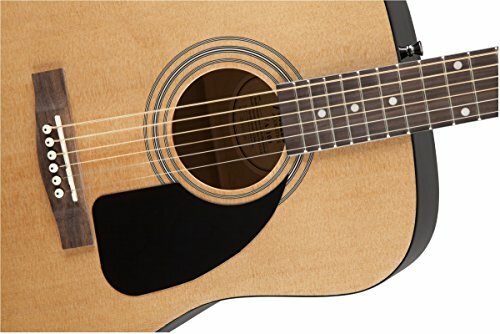 If you’re someone who needs a simple acoustic guitar for jamming sessions with friends or instant performances during a bonfire night, Fender FA-100 can be a good option. It’s not too expensive. Full Martin DX1AE is a dreadnought acoustic-electric guitar for players of all levels. It is made of a combination of endangered tonewoods and sounds great. The hand-rubbed satin finish adds elegance and provides the guitar with a classy aesthetic appeal. Since the sound produced by Full Martin DX1AE is bright, strong, and warm at the same time, you can play all genres. Overall, an excellent acoustic guitar under $600. As you’ve seen in the guide above, these are the 3 key elements that can affect the sound of an acoustic guitar. Guitar player – This one’s all about you and how you play the guitar. Since each person’s hand is unique, the same guitar will sound different when played by different people. Guitar body shape – As already mentioned above, guitars with different body shapes and contours produce different sounds. Tonewoods – Theyseason or add effects to the guitar’s sound. So, by now you should have a much better understanding of acoustic guitars, including how to find the best acoustic guitar on the market. We don’t think we’ve left any acoustic guitar related topic untouched. While we’ve listed the 3 best-selling acoustic guitars on the market, there are still many more that you can explore. While finding a good acoustic guitar, try to define what you want the guitar to do for you. Are you looking for a one-time purchase to meet all your guitar needs or do you want an acoustic guitar to fit a particular style or application? Sometimes it’s easy to find a suitable guitar; sometimes it can be a lot harder than you can imagine. So, if you feel you’ve found the right acoustic guitar, go with your feeling. When an acoustic guitar inspires you in a way that you believe is right, act on it. Remember, your 30-minute lunch break is not enough time to buy an acoustic guitar, especially if you’re a beginner. Plan to spend at least 1 hour or more and compare different acoustic guitars that suit your budget. Make sure you look around, take notes, and read the reviews of existing customers without rushing into a decision. The more experience and knowledge you gain, the more discerning you’ll become. We hope you found the acoustic guitar buying guide useful. If you have any questions for our experts, please feel free to share them in the comment section below. We’ll get you the answer as quickly as possible. Also, if you feel we’ve missed any important information that should have been a part of this buying guide, we would love to hear your thoughts. You can contact us here.